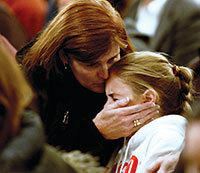 APA President Dilip Jeste, M.D., sent a letter today on behalf of the Association to leaders of both the Senate and House of Representatives responding to the massacre in Newtown, Conn., and emphasizing that psychiatrists "stand ready to do whatever we can to help alleviate the suffering caused by the tragedy and to help the survivors cope with life after a trauma of this unimaginable magnitude." Jeste also expressed APA's concern about proposals that have been voiced that target the mentally ill and media accounts that inaccurately portray people with mental illness. "Stigma remains one of the greatest barriers to early identification, intervention, and treatment for Americans seeking help for mental illness, and we hope that Congress will avoid making generalized assumptions about persons now in or seeking treatment for mental illness," he said. "The vast majority of violence in our society is not perpetrated by persons with serious mental disorders. Research suggests that individuals with mental illness engaged in regular treatment are considerably less likely to commit violent acts than those in need of, but not engaged in, appropriate mental health treatment." Highlighting the effectiveness of psychiatric treatment, Jeste urged policymakers to focus on the fact that "access to comprehensive, effective psychiatric treatment works. Yet at the very time of the Newtown tragedy, federal and state funding of critical mental health services is under siege," he said, pointing out that 29 states have eliminated a total of more than 3,200 psychiatric inpatient beds since 2008. Jeste also called on Congress to address the abundance and easy availability of guns, saying that APA believes that "any discussion on fostering a robust mental health delivery system must not be isolated from discussions of streategies to reduce gun violence." He condemned laws to bar physicians from asking about the presence of guns in a patient's home and pointed out that APA has expressed support for "appropriately targeted proposals such as mental health registries and modified access to firearms as meaningful ways to curb gun violence." The letter can be accessed on APA's Web site at http://www.psychiatry.org/advocacy--newsroom/advocacy/apa-sends-letter-to-congress-regarding-recent-shooting-in-newtownct.